Basic dental care is key to maintaining a gorgeous, healthy smile. Many people assume that dental care is just brushing and flossing your teeth twice daily. However, despite your best efforts at dental hygiene, you can still develop dental issues, like built-up tartar. An appointment at a professional dentist office is the only way you can be positive that your teeth are in tip-top condition. Teeth Cleanings: Brushing and flossing twice daily is certainly a good habit to keep up. However, built-up plaque, known as “tartar,” can still find its way onto your teeth. It’s important to have a dentist remove the tartar as it can cause tooth decay. Our dental staff at Echeverri Dental Center will make sure your smile is in pristine condition with a deep teeth-cleaning. Dental Fillings: Cavities can do some severe damage to your teeth. Once a cavity has emerged, it’s important for your dentist to fill it to halt its progression. We offer two different types of fillings: amalgam or composite fillings. Both will ensure better tooth health. Dentures: Missing teeth can severely limit your daily activities and even your happiness. It can make it difficult to chew, laugh, smile, or talk freely. At Echeverri Dental Center, we want to help you reclaim your smile with dentures! Our dentures are made to look lifelike and natural. We will make sure you have a secure and snug fit, so there is no slipping or sliding! Tooth Extractions: Sometimes, when a tooth is so far decayed, the best thing to help it is to pull it. Tooth extractions can relieve you of your painful toothache. At Echeverri Dental Center, we will make sure you feel relaxed and comfortable during your tooth extraction procedure. Root Canals: Everyone cringes when they hear “root canal,” but it’s really not that bad! At Echeverri Dental Center, our compassionate staff can provide several patient amenities to help you feel relaxed during your appointment. We perform root canals for most teeth, but for molars, we can refer you to a superb endodontist. 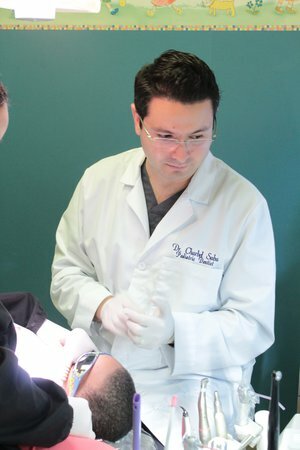 At Echeverri Dental Center, our talented team will work hard to give you exceptional dentistry. Call our office to learn more about general and restorative dentistry. Schedule an appointment at Echeverri Dental Center today for a healthier smile!